The CBOT Dec14 wheat contract has made double digit gains throughout the last week with funds repositioning themselves ahead of the US Thanksgiving holiday. Futures transactions were notably lower and the forward and higher protein markets did not see the same gains – we see this as a point to note for local protein values. U.S. financial markets are closed until Friday night when they trade half a session. This could result in less local buyer appetite from traders for the rest of the week as some key markets to off-set their risk are closed. The AUD/USD has also done some work to the downside which is assisting our local prices. At the time of writing it is around $0.8550. Locally, high protein wheat is holding on to a premium delivered to the packer over the bulk system. Growers should not be selling grain with screenings above 5% without calling us as we are achieving better prices through negotiation. The durum market seems to have peaked this week, with values back $10 off the highs. DR1 is now around $608 NTL, less $10 for DR2, & a further $10 to DR3 – these spreads have held. APH1 is still bid around $330 delivered Narrabri packer, with APH2, less $17. SFW1 is bid $328 delivered Darling Downs for January, or around $285 ex-farm Narrabri. Feed barley is about $20 to $25 less than SFW1. 2015 sorghum is bid $336 Downs, this is up $40 from October, reflecting the dry conditions. Chickpeas are bid $470 delivered Narrabri for Dec/Jan, with a $5 per tonne carry per month for February. Faba bean demand into the packer is quieter at the moment, as is domestic demand. Canola is bid around $450 ex-farm Narrabri depending on your oil. When pricing canola, growers should be considering their oil to know whether to get a flat priced, or oil premium contract. The past week we have seen heavy sellers of durum in the system and those that are still holding durum on-farm are happy to do so until Jan/Feb and further out. Prices are very much site-based and the spread between sites does not reflect the published location differentials. Please call to offer any parcels of durum you have to sell as we have a number of buyer that can be buying above published bids on any given day. Prices seem to have flat-lined and haven’t been rallying strongly in the past few days like they previously have. We still have interest in all grades of breadwheat. High protein wheat is in demand into the packers in both Narrabri and SQ. This traded late last week at $300XF in the Croppa Creek area for prompt pick-up and delivered Narrabri $325-330/mt. 70/10 delivered Downs remains between $325-330/mt for January delivery. Wheat in the system softened a few dollars last week and is holding steady this week. Pulse values onto the Downs have seen $490/mt delivered for Jan/Feb delivery and Narrabri at $470/mt for the same period. Faba beans demand into export markets is backing off again now and the shift is toward domestic demand. The difficulty we face now is moving large parcels promptly. Most consumers on the Tablelands aren’t cashed-up or in a position to pay these high prices for faba beans are are trying to source alternate, cheaper feed sources. Rain received has been pretty disappointing, and much more is needed for desperate summer crops. Fingers crossed we see some more falling in the coming days/weeks. Commodity markets have been mixed over the last week. The domestic delivered markets in the north are back around $10 per tonne. This has influenced prices for both lower grade & high grade wheat, & barley. This was due to the market taking a very quick run to the upside on the back of continued dry & hot weather. As markets tend to do after a fast rally, they ran out of steam Thursday afternoon last week. This was largely due to harvest pressure in Central & Southern NSW. Once this pressure has subsided, if all things remain equal ie. hot dry weather & no rain, we would expect the downside to be limited. However, at the end of the day, there is an exportable surplus of grain on the east coast, so southern grain will have to move to export parity. With some major international export tenders coming up, Australian wheat & barley export competitiveness will soon become clearer. Other news to watch will also be how the northern hemisphere crops go in to dormancy. We have seen recent strength in futures markets over the last week on the back of ‘winter kill’ concerns for this crop in the Black Sea region & North America. However, this won’t become clear until March/April next year as this crop comes out of dormancy. Locally, high protein wheat is holding on to a premium delivered to the packer over the bulk system. Growers should not be selling grain with screenings above 5% without calling us as we are achieving better prices through negotiation. The durum market seems to have peaked this week, with values back $10 off the highs. DR1 is now around $595 NTL, less $10 for DR2, & a further $10 to DR3 – these spreads have held. APH1 is still bid around $330 delivered Narrabri packer, with APH2, less $20. SFW1 is bid $325 delivered Darling Downs for January, or around $280 ex-farm Narrabri. Feed barley is about $20 to $25 less than SFW1. 2015 sorghum is bid $336 Downs, this is up $40 from October, reflecting the dry conditions. Chickpeas are bid $470 delivered Narrabri for Dec/Jan, with a $5 per tonne carry per month for February. Faba beans are best priced on an offer basis, but are around $400 Narrabri packer. Canola is bid around $450 ex-farm Narrabri depending on your oil. When pricing canola, growers should be considering their oil to know whether to get a flat-priced or oil premium contract. This past week the star performer has certainly been Durum. This week it has traded as high as $570/mt at site (Emerald Hill) for DR1, with a $10/mt discount to DR2 and a $20/mt discount to DR3. Today, the market feels a little cooler and a number of buyers have withdrawn from the durum market, or pulled their bids back considerably. We suggest to growers to be cautious and not to miss-the-boat on these prices. We all know grain markets can fall even quicker than they rise. We continue to have interest in high protein wheat delivered Narrabri, with APH1 values close to $330 and APH2 values around $310. H2 and AUH2 is also in demand but the container market is really looking for high protein wheat for export. HPS1 with protein below 13% isn’t really in demand at the moment. Lower grade wheat value in the system are lifting slowly as wheat is becoming wheat due to dry conditions. The delivered Downs wheat market got to $340/mt delivered for Jan and is around $327/mt today. We believe this to be on the back of rain forecast, combined with selling pressure from sellers of grain in the Central West and Southern NSW. We still have strong interest in canola both ex-farm and in the system, particularly in Moree. We can price ex-farm on a flat-priced basis or subject to full AOF premiums and discounts for oil & admix. Chickpea values are stronger this week, at $490/mt delivered Downs and $470/mt delivered Narrabri today. We have seen grower selling emerge given this recent rally in peas. We have pricing points for chickpeas onto the Downs, delivered Brisbane, Goondi, Moree, Narrabri and Dubbo. We can also look at ex-farm parcels. It’s been another hot dry week with more hot weather predicted over the next couple of days. Harvest has progressed quickly into the south with most in the north either finished or are cleaning up the last little patches. The recent USDA report was generally uneventful. The world clearly has plenty of grain supply, no one can deny that. What is also clear though, is whilst there is plenty of grain in the world, it doesn’t change the fact that there is a drought on the east coast of Australia– only rain can change that! Without rain, we only see our local market remaining supported. Australia’s yield forecast is lower than first expected which is also helping prices. Wheat prices have improved over the past week, with high protein APH1 wheat back to $330 delivered Narrabri packer. The domestic feed markets have also rallied for those who are willing to store, we’re seeing a $340 delivered Darling Downs for January SFW1, $320 for barley. Which means we have strong ex-farm numbers, especially compared to a $250 delivered for F1 around the LLP. Durum is trading at $440 at a local site, $425 XF for DR1. Canola has firmed to $440 ex-farm in the domestic market with flat priced contracts available. These are good for growers with lower oil – below 40%, as you won’t get discounted as much. Full oil contracts are available at premiums to this price. Chickpeas are back to $460 delivered Narrabri for December, with Faba beans up to $400 delivered Narrabri. Cotton has been stuck in a range from $450 to $460, and has move back to $440 in recent days. Please call to price up your parcel today!!! As harvest continues and progresses further south, we are continuing to see a mixed bag in terms of quality. Yields are generally better-than-expected across the region, considering the tough season. Barley quality has been consistently F1/Malt, with minimal off-grades around. Prices today are around $308/mt delivered Ranger’s Valley and with a $40-42/mt average freight to LPP, is a far better return than selling into local delivered markets at $250/mt. Barley prices have jumped around $10/mt in the past two weeks. Chickpeas have bounced recently and today are $448/mt delivered Narrabri for December delivery. Delivered Allora is $467/mt for Nov/Dec. We are happy to look at ex-farm prices as well. We are still buying high protein wheat delivered Narrabri or ex-farm. These values are still at a significant premium over the domestic market. The domestic market continues to strengthen, as expected. Delivered Downs for prompt movement is around $315/mt and January movement is $330/mt delivered. Durum prices today are well above $500/mt in the system at Moree, Edgeroi & Bellata. We are keen to look at offers on all grades of durum. We can look at ex-farm or system deliveries. Canola values are also fairly strong ex-farm compared to system equivalents. This year we are seeing a strong market for minimum 38% or 40% oil, flat-priced into the domestic markets. Deferred pick-up premiums far outweigh the cost of carry and we can look at a Jan through to June pick-up. Please call our office if you have any queries regarding prices, or are interested in discussing a marketing plan for this season’s grain. Futures were mixed last night with wheat 5.5 cents lower, corn up a few cents and soybeans up 10 cents. Our Aussie Dollar dropped 1.6 cents overnight, which has led to stronger values locally today. We are seeing wheat values $1-10/mt stronger, depending on grade and location. Higher grade wheat remains at a premium to lower grades into packers and in the system. We still have the view to sell higher grade wheat now and if you were looking to retain wheat for sale in the coming months, that it will be those lower grades that will rally the strongest if it remains dry. Durum is the shining light of grain prices this season. We have mentioned previously we have strong demand for durum, this remains and we would like to see offers on DR1 in the system and on-farm. Today, we have seen DR3 spreads narrow to a $25/mt discount to DR1. We have strong demand for canola both in the system and ex-farm. Bids around Narrabri are around $435/mt ex-farm for min 38% oil, flat priced. We have Nov/Dec/Jan homes into this market. Likewise, we also have oil markets that would be subject to full AOF specs for high oil canola. Faba bean values are still around $400/mt delivered Moree, $395/mt into Wee Waa, however most of the crop has been sold into these export slots or bunkered down on-farm for sale over the coming months into the domestic market. We do have interest in some Feed-type fabas around $335-340/mt ex-farm Narrabri. We still have hectare contracts available for mungbeans. Please contact us to discuss options. We also have seed available in Crystal and Jade varieties. 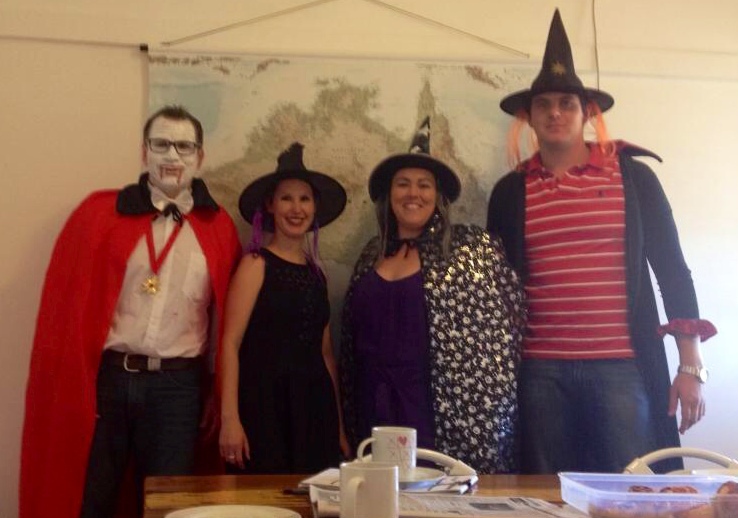 We decided to have a bit of fun in the office for Halloween on Friday. I believe Steve gets the prize this time. He does love a good dress up!